Of arms and the man, they sing. Well, men. And also scabies, microwave lasagna, Mayan legends, Siamese fighting fish and a flatulent hussy named Avalanche. In Mark O’Rowe’s word-drunk and whiskey-soaked 1999 play, “Howie the Rookie,” two young Dublin louts — one named “The Howie Lee,” one named “The Rookie Lee” — deliver rowdy monologues. Howie Lee and Rookie Lee – no relation – share a surname and a city, Dublin. In Mark O’Rowe’s revival of his own cult classic, both men are played by a single actor, Tom Vaughan-Lawlor, and they seem to share much more besides: a Neanderthal gait, empty eyes and a slack-jawed drawl. It’s like they were destined to meet in fateful circumstances. Mark O’Rowe’s vibrant, scabrous, picaresque tour of the seedy side of life in Dublin announced the Irish writer as a talent to be reckoned with when it premiered at the Bush Theatre in 1999. O’Rowe himself directs this production, the first major London revival, and has now smoothly transformed a two-hander into a one-man show. 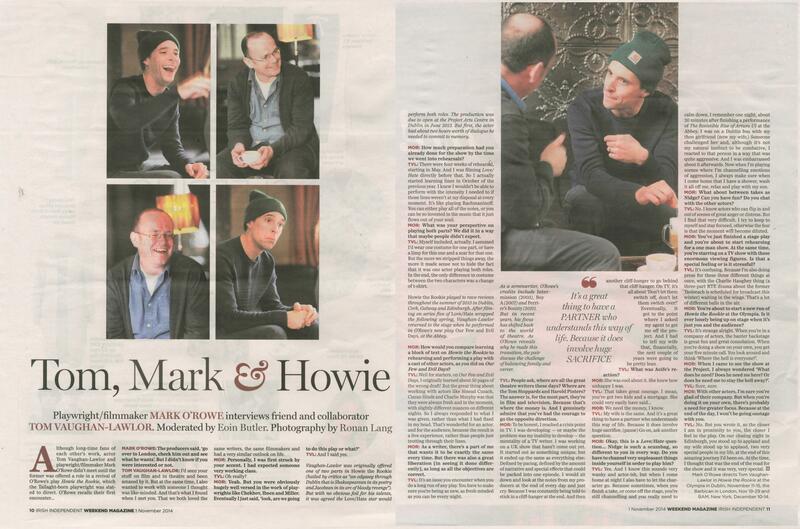 Tom Vaughan-Lawlor and Mark O’Rowe interview each other in the Irish Independent on 1st Nov 2014. Nadine O’Regan chats to Mark O’Rowe and Tom Vaughan-Lawlor ahead of the return of Howie the Rookie. It is curtain call at the end of the first preview of Mark O’Rowe’s emotionally bruising new play, Our Few and Evil Days, at the Abbey Theatre in Dublin, and the audience are on their feet. On stage, five actors, among them Tom Vaughan-Lawlor, take their bows. Looking out into the auditorium, the cast seem tentative, grateful, humbled by the warmth from the audience, that previously unknowable but essential piece of the jigsaw of theatre.